Music is not meant to be passive. Regardless of experience, one can learn and participate. Below are some of my favorite communities available to amateur musicians. All are open, welcoming, and educational. Most have chapters throughout the country. Even if a newcomer doesn’t feel like playing, listening is free and an audience is always appreciated. The classic American tradition commonly known as Sacred Harp has experienced a widespread revival throughout the United States in the last decade. Sacred Harp ( a reference to a popular collection of 19th Christian hymns) uses the common “Shape-note” format to easily organize four-part harmonies among singers of little musical experience. The ease of the format allows for the creation of large amateur choirs and the result can be awe-inspiring. 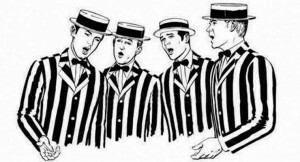 Singing unison inside of a large group is a powerful experience; it is therefore not surprising that Sacred Harp describes itself as a music first and foremost for singers themselves. 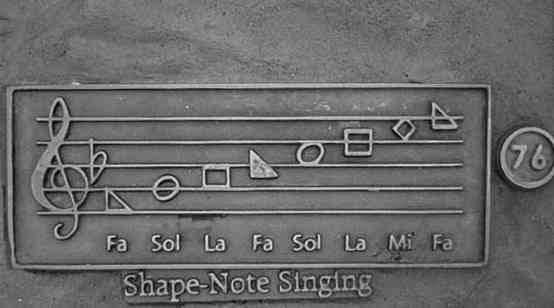 Learning Shape-note : A great overview of the shape-note singing method can be found in this pdf, there are also several good lessons available on youtube. Finding Communities : Shape-note singing groups are widespread in the Pacific Northwest and nationwide. Resources : The only resource needed is the Sacred Harp book on sale in Amazon. However any regularly held shape-note gathering is likely to have several extra-copies. Sharing is common. The Sacred Harp is designed for and by amateurs. Expect to see many different skill levels at their gatherings and don’t let lack of experience be a deterrent to attending. A fun experience for those looking for 19th century songs with a more secular slant. Though traditionally restricted to male singers (though female groups do exist!). Barbershop is hokey old-time fun focused on participation and good cheer. Be prepared to learn and sing! Be sure to stay late. Barbershop “afterglow” dinners are filled with cheer, camaraderie and spontaneous singing, in a word all the things that make participatory music great. A personal favorite. Oldtime jams are easy to find in most urban areas. For amateur instrumentalists there is no better way to break into group playing and participation. Singers are also welcome. Learning Oldtime style: Assuming one already has a basic competence at an instrument, the best way to learn oldtime style is to listen and copy. Many excellent YouTube channels exist (including my favorite: John’s Fiddle Lessons). Another great resource is the “Amazing Slower Downer” ( ASD ) which can slow down recorded songs without altering pitch. It’s a perfect tool for fleshing out an oldtime playlist from an existing mp3 collection. Finding Communities: A good general resource to keep in mind is folkjam.org, still the best places to find gathering is through independent music stores, local sites, and word of mouth. General Resources: Sheet music and midis here, here, here, or here or simply purchase the Fiddlers Fakebook a great collection of tunes that are played everywhere. Although the standard instruments typically used in oldtime are the fiddle, guitar, banjo, mandolin, bass, and dobro, I have seen any number of instruments appear at gatherings from zithers to theremins. Possibly even more ubiquitous than oldtime gatherings, celtic sessions can be a roaring good time. Bring a fiddle, flute, or drum with a few tunes under the belt and prepare for an evening of fun. Learning Celtic: a great book that details the fundamentals of Celtic (fiddle) style is that by Peter Cooper. Cooper fully details the music and provides ample examples and recordings. Find Communities: The session.org has an excellent search engine to find irish sessions in almost any city. General Resources: Once again The session.org provides tabs, midis, and sheet for almost any celtic tune commonly played in Celtic sessions. There is even an iphone app that will locate a played tune within thesession.org’s digital library. 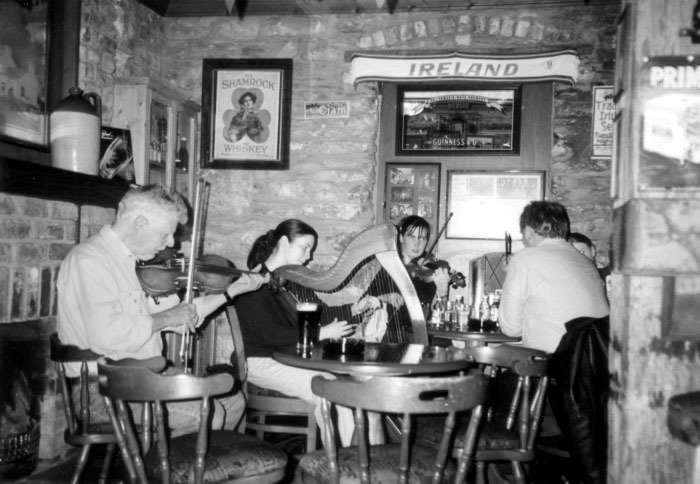 Many irish pubs sponsor celtic traditional jams and drinks are often provided. Join up and there could be a free Guinness in the bargain.